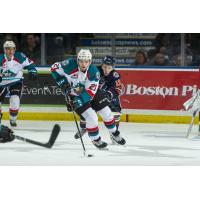 The Kelowna Rockets fell to the Kamloops Blazers 2-1 in a shootout Friday night at the Sandman Centre in Kamloops, BC. The Rockets had their first chance on the man advantage 1:32 into the opening period, but Kamloops was able to kill it off. The Blazers headed to their first power play at 14:26 after Schael Higson tripped a Blazer, the Rockets penalty killers shut down the opportunity. The two teams headed into the first intermission deadlocked in a scoreless tie. Martin Lang (11) opened the scoring 16:13 into the second period, giving the Blazers a 1-0 lead. Lang took a shot from the left faceoff dot, the puck bounced up off of Roman Basran's glove and into the Rockets net. After the ensuing faceoff, Kaedan Korczak dropped the gloves with Brodi Stuart. Things continued to heat up, Michael Farren and Connor Zary were sent to the box for offsetting roughing minors. The Blazers held a 2-0 lead after two periods of play. Zary was assessed a penalty for boarding at 2:18 in the third, 27 seconds later Quinn Schmiemann flipped the puck into the crowd giving the Rockets a five on three power play. Nolan Foote (34) took full advantage, firing a dart past Blazers starter Dylan Garand to tie up the game. After three periods of play, the game remained tied at one, forcing overtime. The two went back and forth during five minutes of sudden death play, but neither could strike. A shootout was needed to determine a winner. Zary opened the duel with a goal, Topping was stopped by Garand. In the second round, Orrin Centazzo was successful, Garand shut the door on Foote to secure the 2-1 victory for the Blazers. The Kelowna Rockets record is now 27-30-5-2. Basran turned aside 32 of the 33 shots he faced, his record moves to 19-17-3-1. The Blazers outshot the Rockets 33-27. They'll return home tomorrow to host the Blazers for 'RE/MAX Presents: WHL Suits Up with Don Cherry to Promote Organ Donation' game. There will be new Don Cherry bobbleheads and specially themed jerseys that will be up for auction. Tickets are on sale at selectyourtickets.com, at the Prospera Place box office or by phone at 250-762-5050.